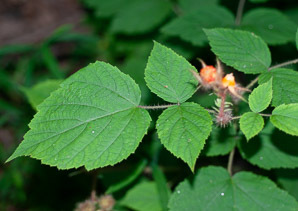 Wineberry is a perennial, deciduous thicket-forming woody shrub. Native to China, Japan, and Korea, it was introduced into Europe and the United States. It is found in disturbed areas, waste places, and open areas, particularly at the forest edge, in fields, open woods, and along streams, and wetlands. 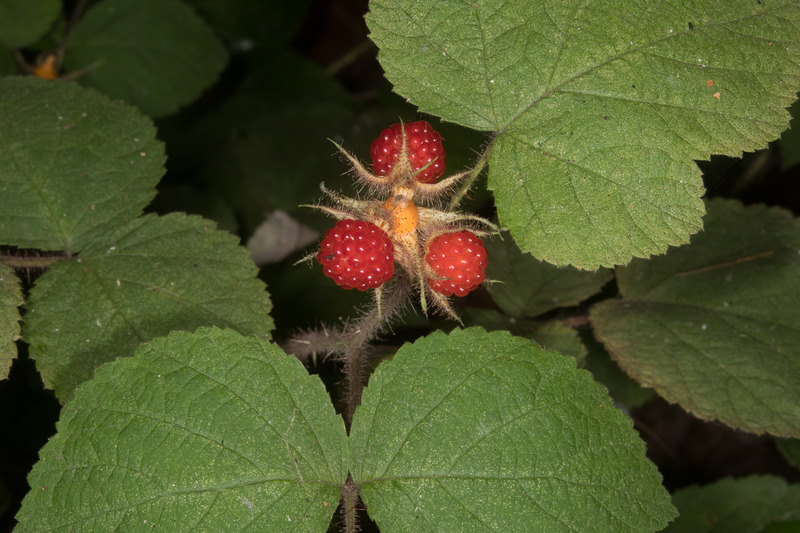 In her book The Complete Guide to Edible Wild Plants, Mushrooms, Fruits, and Nuts, author Katie Letcher Lyle recounts a local legend of Thomas Jefferson importing wineberries to his home at Monticello. Since Jefferson is quoted as saying “The greatest service that can be rendered to any country is to add [a] useful plant to its culture,” maybe wineberries were officially introduced into the United States by the 1890s as an ornamental plant and for raspberry breeding. 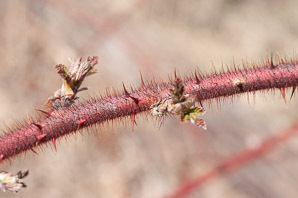 Having escaped cultivation, it has become invasive in many areas and is restricted in some states. 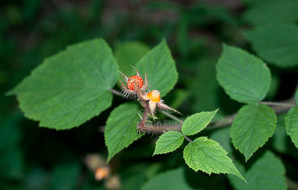 Wineberry is more aggressive, with a greater tol­erance range for moisture, soil, and light. 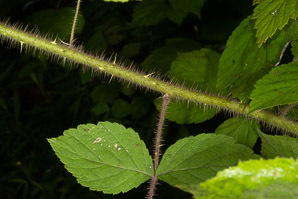 It can produce impenetrable thickets crowding out native plants, including canefruits. 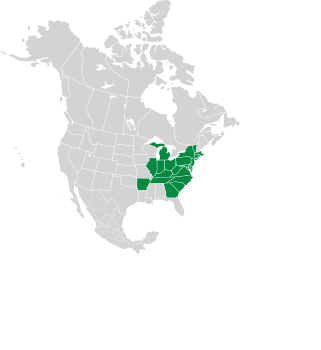 Management may be achieved with mechanical methods, chemical control, or a combination. Plants: Arching canes covered with bristly thorny prickles and dense glandular red hairs can be identified in winter, even at a distance. Like other raspberry species, first year canes (primocanes) are vegetative, unbranched, and form from root buds near the ground surface. 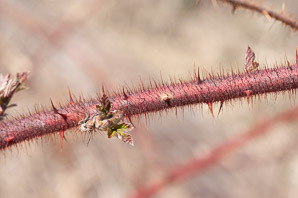 Second year canes (floricanes) are branching, flowering, and fruiting. Propa­gation occurs via seed dispersal (animals), from root buds, and canes rooting where tips contact the soil. 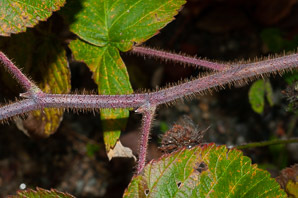 Cane length is 19-59" (48-149 cm), on average, and up to 9' (2.7 m). 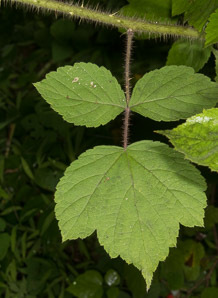 Leaves: Alternate compound leaves composed of three serrated leaflets with a larger somewhat heart- or spade-shaped central leaflet and smaller side leaves with pointed tips. Leaves are green above and silvery-white beneath, emerge in spring (April) and drop in fall (November). Flowers: Inconspicuous green flowers with five white to pink to rose colored petals bloom in spring (April-June). 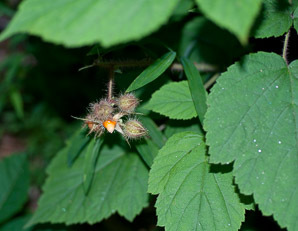 Wine­berries are self-fruitful and do not require a pollinator. 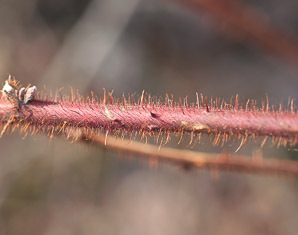 After pollination, the sepals close forming a calyx over the developing fruit. Fruits: The berry-like fruit, ⅜-½" (1-1.5 cm) in size, is technically a drupe. 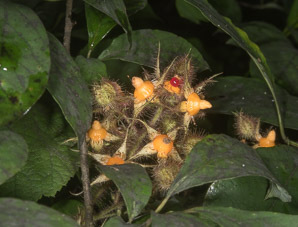 The developing fruit is enclosed in a sticky, hairy calyx, opening when fruit is orange-red and nearly ripe. Juicy ripe fruits are a bright ruby red, leaving the core on the stem when plucked. 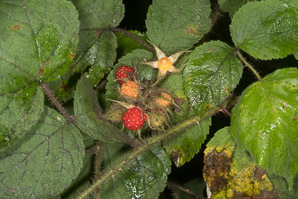 Fruits ripen about two months after flowering. Fruits being somewhat sticky can trap small insects. The fruits are similar to raspberries in appearance, with a pleasantly tart taste. Edibility: Wineberries can be eaten fresh or cooked using any recipe for raspberries or blackberries. Handle berries gently as they are tender, somewhat tacky, and can break apart easily. Medical: No specific herbal or medicinal uses reported. Rubus phoenicolasius description by Anita Kraemer, last updated 21 Apr 2019.